Sandbag training is currently taking the world by storm as it allows you train your body in a way that no other piece of equipment can. 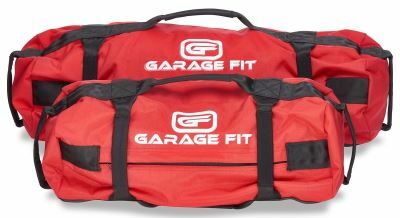 Today we are looking at the Heavy Duty Workout sandbags by Garage Fit. Our training sandbag guide goes into the world of sandbag exercise in detail. As their name suggests, the Heavy Duty Workout Sandbags are manufactured from on of the strongest fabrics around (extra tough nylon Cordura) which is used in bulletproof jackets. It is also stitched together with a very high quality threading. These components combine to create a super durable bag that can withstand being thrown around without damaging the bag. This material is also waterproof. So if by any chance it starts to rain while you are working out outside, the nylon material will prevent the bag from absorbing water and making your load heavier. 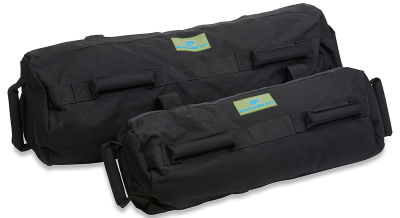 There are two types bag available in the range these are 30lb-60lb which are available in green, black and red. 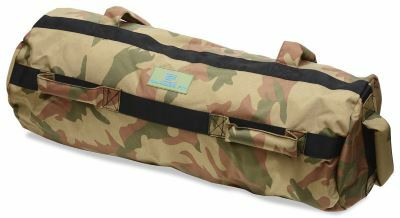 There are also 60lb-120lb bags which are available in camouflage or black. The smallest of the Heavy Duty Workout Sandbags weigh 30lbs while the larger ones can rack up weights of up to 120lbs. The internal bags are double-sealed with a strong velcro mechanism to prevent and sand leakage within the bag. Using these inner bags helps in creating unstable movements that make your workout more challenging. The 30lb bags include a single filler bag. The 60lbs bags sport a second liner that enables weights to swap around easily providing different styles of training. The 60lb and 120lb camo and black sandbags include three liners. The Heavy Duty Workout Sandbags’ ability to adjust weights make them a strong choice for both beginners and experienced trainers. To adjust the weight, simply remove or add filler bags. Sandbags take a beating and usually get dirty pretty quickly. A great advantage of the Heavy Duty bag is that they don’t require hand washing. So the sandbag can be stashed inside the washer machine and come out spotless despite their tough material. The Heavy Duty Workout sandbag is extremely practical in helping users in becoming stronger and developing endurance. The bags’ weight can be utilized to impact both the lower and upper parts of the body. The quality of the materials and stitching is outstanding which makes sure it will be reliable for a long time. Give them a try, and see for yourself.